Jeremy Felt – Page 3 – Open source student. The last time I started writing this post it turned into a whole post of its own. Luckily I have more things! Drunkard’s Rock is my new favorite page on the internet. Don’t open it on mobile, the HTML alone is 25MB and there’s a list of 100,000 band names. This is a computed drunkard’s walk through The Echo Nest’s artist-similarity graph, starting at Black Sabbath because a) that’s where I felt like starting, and b) that’s how Paul Lamere’s Six Degrees of Black Sabbath measures artist-relation distances. Each step here goes from the previous artist to what we believe to be the most similar one which has not yet appeared in the list. I had so much fun last night searching through the list for different bands and then listening to tracks from bands on either side of them. I would love to see how the list varies depending on the starting band. It’s crazy to see how the genres ebb and flow in certain areas. The creator of that site, Glenn McDonald, is a Spotify data alchemist, and it’s fun to follow some of the crazy things he builds there and in the playlists on Spotify. Another new favorite on that site is the Spotify Listening Patterns by Gender. When listeners play Spotify editorial playlists, they end up streaming 23.5% from female artists, which is 3.0% better than when they choose their music themselves. It would be fun to play with all of Spotify’s music data. I’m about two-thirds through Madeleine Albright’s Fascism: A Warning. It’s been really interesting to read her perspective on fascism and on leaders and politics in general. What an entirely full life! One story that caught my eye was the fascist presidential candidate that was on the ballet in only one state (Washington!) and got 1598 votes. I had to start poking around for more on him immediately. Sure enough: William Dudley Pelley was a (self-founded) Christian Party candidate in the 1936 election. Crosscut discusses the Northwest’s uneasy relationship with fascism. This led me to read more about sedition as a crime. It’s crazy that the US enacted the Sedition Act of 1918, which—more than sedition, which was already illegal—banned “disloyal, profane, scurrilous, or abusive language” about the US government. It was repealed 2 years later, but whoa! As I keep mentioning, I switched to mostly cans for beer last year because of Pullman’s trouble with bottle recycling. This year I’m trying to do more growlers. It’s really cool to see that Oregon is having so much success with bottle deposits and I wish we had the same kind of thing going on in Washington. Sierra Nevada announced their Resilience Butte County Proud IPA last year during the destruction caused by the Camp Fire. They established the Camp Fire Relief Fund, to which 100% of the proceeds from the Resilience IPA would be donated. At the same time they invited other breweries to make the same beer from the same recipe and donate their proceeds as well. 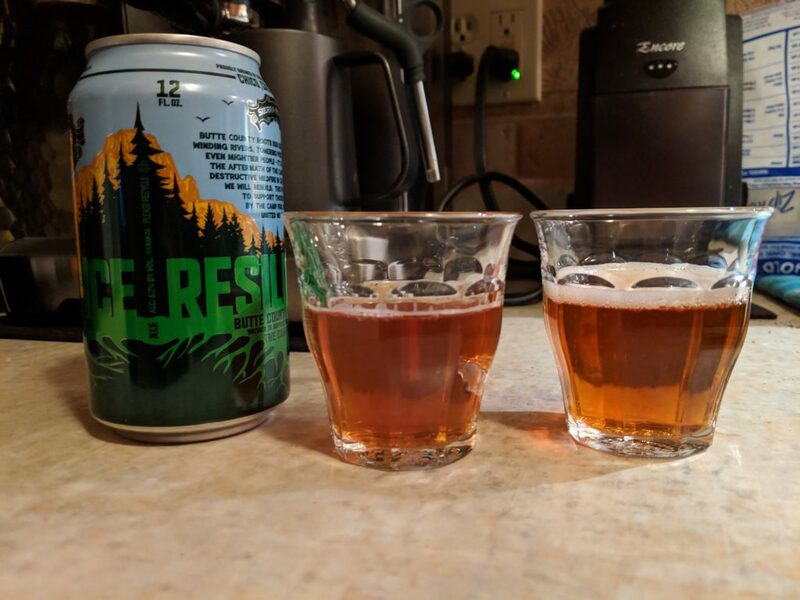 In the photo above, the Resilience from our local Paradise Creek brewery is on the left and the Sierra Nevada Resilience is on the right. The local brew is a little cloudier, though that could be due to the growler pour. I had a really hard time distinguishing between the two. If I had to pick a difference, I’d guess that the Paradise Creek version has just a touch more of a dry-hopped taste somewhere in there. But really, they are super close. Nothing great about it, but they stay true to the originals so it’s easy to sing along. That’s not the point though. Any time I talk about Weezer I’m reminded of the second time I saw them live. In fact, until tonight, I had completely forgotten about the first time I saw them live: at Q101’s Twisted Christmas 3 in Chicago, 1996. That just sparked a whole other train of memories! But the second time! United Center, September 21, 2001, when they were touring for the Green Album. 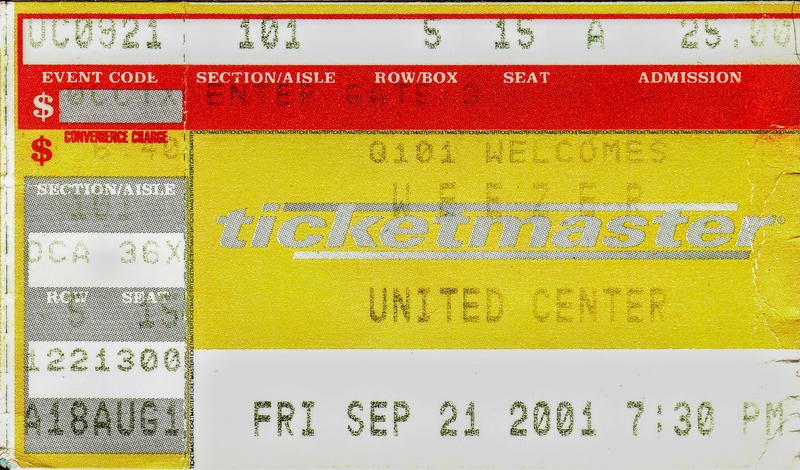 I have this memory of disliking Weezer strongly after that show because I paid $40 for (likely) mediocre seats and they played for 45 minutes with a one song encore. The other thing about that show is they had Cold as the opening band. Cold sounded nothing like Weezer and the crowd couldn’t stand it. It was the crowd’s booing that night in Chicago that resulted in Cold leaving the tour early. In trying to figure out why they were on tour with Weezer in the first place, I found that Rivers later worked with Cold on Stupid Girl, a song from their 2003 follow-up album. I can only assume he enjoyed something about their earlier work and asked them to join the tour. So there you have it and now I’m done writing about Weezer. P.S. If you haven’t seen this SNL sketch about Weezer, it’s one of the best. I just want to see what shows up in the RSS feed as this post’s title when I don’t add a title. Having to think of a title on every blog post is overrated, IMO.